St Anthony was born into a wool manufacturing family at Sallent, Spain. At 12, following his early education in the local village school, he became a weaver. Later he moved to Barcelona for specialist training in his trade and remained there until he was 20. Recognising a religious calling, St Anthony entered seminary and was ordained a Priest at 28. He then performed missionary work throughout Catalonia and the Canary Islands and, established the Claretians. At 42, St Anthony was appointed Archbishop of Santiago in Cuba. There he established numerous schools, vocational centres and hospitals, all to help the disadvantaged and poor. At 50, St Anthony was recalled to Spain to act as Confessor to Queen Isabella. On his return, he continued his great work with the poor and needy in Spain, Italy and France. St Anthony’s writings, in excess of one hundred documents, include many of his missionary sermons. 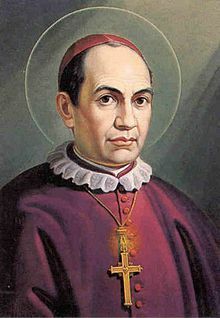 His Feast Day is the 24th October. He is the Patron Saint of textile merchants, weavers and the Claretians. Pray that we will see and help the poor and disadvantaged in our community.